One of the best things about being a Nana are what seems like endless opportunities to be happy, celebrate milestones and pamper the people you love in a guilt-free way! Recently I’ve had more cause than usual to jump for joy—a beautiful new grandson who joins my two older, sweet-as-can-be grandkids, a thriving career as a cookbook author, and, most recently, the proud acknowledger of the Nana Network’s 1,000th fan!!!!! Who knows exactly when it happened, but when I logged into Facebook to post what I try to make daily and relevant newsfeeds to all my fellow Nanas, I noted that we jumped from about 995 fans to 1,002. I’m tickled pink! This news is, as my mother used to say, “something to write home about,”—so that’s what I’m doing: addressing all my fellow Nanas in the form of a letter—mostly just to thank them for reading me, but also to remind them of the Nana Network’s mission statement (U can see it by clicking here) and what we’re all about. 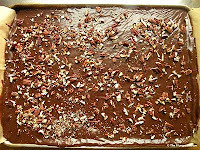 If I could reach out and pat each and every one of you on the back, then invite you over for a little coffee clatch to talk turkey on organizations that benefit our large extended families, I would serve you Chocolate Mocha Sheet Cake; my recipe is a kicked up version of the Texas sheet cake classic, which you may as well refer to as hospitality itself, served up rich n’ gooey in a 9X13 jellyroll pan. Culinary historians trace Texas sheet cake back to Lady Bird Johnson—who herself had 7 grandchildren and 10 great grandchildren! 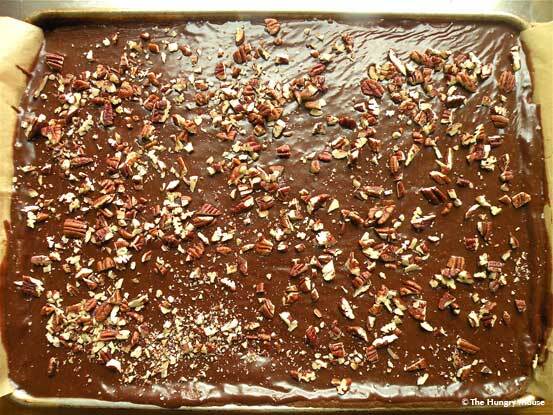 A Texas sheet cake is perfect for any occasion, particularly those milestone celebrations that having loads of grandchildren merit from day to day. Personally, I love this cake recipe—amended to my exact liking—because it allowed me to really work with it and get creative; you can whip it up in the time it takes to eat lunch with your husband, which is to say, in about 40 minutes. Stir it, bake it, ice it and send him back to the office with an unreal treat to go with his next coffee break. The cake is versatile enough that you can layer its traditional chocolate frosting with anything you want—from crushed peppermints, to coconuts—to the walnuts or pecans that reign supreme in the Pecan State of Texas. Young or old, everybody loves it, and what’s best? Since the recipe calls for 1 small full-bodied, delicious cup of coffee, you can go ahead and make a whole pot. Serve the remaining 9 cups in the coffee carafe to your caffeine fiend friends! Here’s what I’ll be talking about at my sheet cake party: things I’ve found to help my daughter-in-law welcome her new addition. Naturally, she’s exhausted but quickly on the mend; still, no matter how fast she and my son get back on their feet, it doesn’t hurt to know about resources like Amazon Mom. If you’re looking to buy diapers and wipes, in bulk—at deep discounts with 2 day shipping, getting your free registration underway on this is a great idea. The site saves you 30% on all baby related purchases, and hooks you up with award winning baby supplies, essentials and toys. As a Nana, I’m finding that my grown kids—in the approaches they take raising my grandchildren—are educating me, too, on what’s out there. If you hop on the website “Take Them a Meal”, you’ll find an online sign-up sheet that lets you organize a custom fitted local network to feed someone you love—someone who may be going through something and cannot easily prepare nutritious food for themselves—basically a very streamlined version of “Meals on Wheels”, befitting of this marvelous digital age in which our grandchildren are a part. And now, my friends, I leave you to your coffee and sheet cake. Keep reading, keep smiling, keep cooking!